With some class acts in the field, the Points race was always going to be the highlight of the evening. 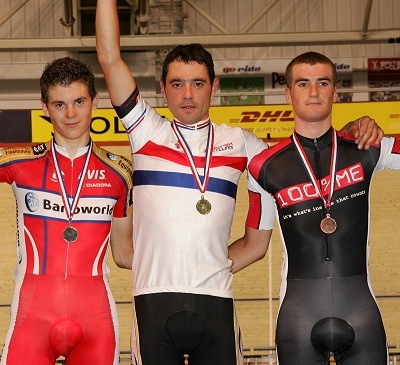 Adam Blythe took top points in the first sprint. Newton began what was to become a tour de force, taking 5 points in the second sprint to add to his 1 point in the first sprint. Burke led out sprint 3 and held on for the 5 points. 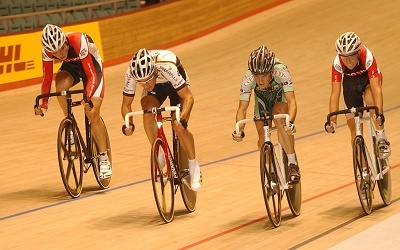 Following sprint 3, Manning and Kennaugh broke away and took top points in sprint 4. 4 riders, Swift, Bellis, Kennaugh and Russell Hampton all gained a lap. Blythe punctured and rejoined on a different bike. After suffering the blow of suddenly being 20 points out of contention, Newton wasn't going to take it lying down and clawed back points in the following three sprints at the halfway stage Newton had almost nullified the lap gained by the earlier breakaway quartet. Newton and Bellis stayed away and were joined by Kennaugh and took half a lap before Ben Swift kicked and started the chase. Newton, Bellis and Kennaugh stayed away allowing Newton to amass more points and move into 2nd overall behind Bellis. The trio took a lap (Kennaugh's second lap gained) and leapt ahead in the overall standings with 53 laps to go. Newton then came straight through the field and took the next sprint closely followed by his nemesis Bellis. The race had become a war of attrition by this stage with just over a dozen riders remaining and the field splitting into two, with Bellis crucially missing the split and losing a lap and 20 points into the bargain. Newton continued to accrue points and press home his advantage. Come the bell lap, Newton sat up, job done, the true elder statesman, allowing Bellis and Swift to contest the final sprint, with Swift edging it and taking Silver, tied on points with Bellis. A thrilling race and a supreme show of talent by Chris Newton and a potent reminder of the quality of the younger riders coming through the endurance programmes. Chris Newton: That was pretty tough really. I trained quite hard for that. I missed a few stages so I trained quite hard on the track and tried to replicate what I was missing. I was quite nervous before the start even though I knew I had good legs but you still have to go through the pain and get it all out. It was possibly the toughest I have won at the nationals. You didn't know where the winning move was going to come from and there were a lot of good guys there which makes for good racing. I know the field thinned out for the end but the move could have come from nine or ten riders. It is satisfying to win a race like that. I put so much expectations on myself and I have to keep roving things to myself and don't rest on my laurels. So its enjoyable but hard work! When the early move went and I missed it, I was frustrated but I knew I had to be patient and go again and I could sense in the ride that the speed was dropping and see it in the faces that it was starting to hurt and I knew I had to put in a double attack and as soon as I got a lap, a move went and I felt really good then. The back end of the race felt really good. I knew I didn't have to win sprints (he was a lap up on his nearest rivals) so I was able to roll on the wheels and pick up third and fourth places and that kept me out of trouble. 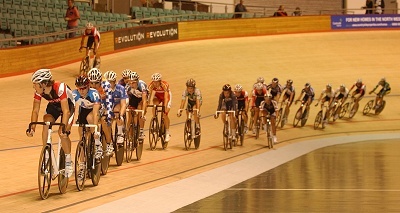 I thought about going for the last sprint but then thought I'd leave it for tomorrow (Scratch race). Jonny Bellis: The first bronze was the hardest (World Under 23 Road Race Championship) but this was also hard in a different way. It has been a while since we have been on the track so I put quite a big gear on going into to it and go for the laps more than the sprints and towards the end it ended up being a battle for the sprints between me and Swifty. Before this race, all I had done was two 20 minute blocks on different days. In something like a Points race, it doesn't make that much difference because you have to be strong. I think in the Scratch race is where we'll feel the likes of the road race in our legs. We won't have the zip. Every time I see people now, they are congratulating me on the medal in the Worlds. It's a good feeling that people are pleased for me and I'm pleased with the medal too and can hopefully take that confidence into other races in the future. Ben Swift: That was horrible! I always knew it was going to be hard because of the quality of the field but didn't expect it to be that hard. The cadence and the speed on the track is totally different. To come here and spin the legs, the first time on the track the legs felt so tight. Nothing can really prepare you for an event like that coming straight from the road. It was good to be able to race Jonny. I was trying to keep track of where we were in the race when I wasn't breathing through my ears and there was a moment when we looked at each other and smiled and knew it was on. That was fun.